Sewing, painting and playing with clay - these are a few of my favorite things. Together they combine to make a very pretty three color bag. 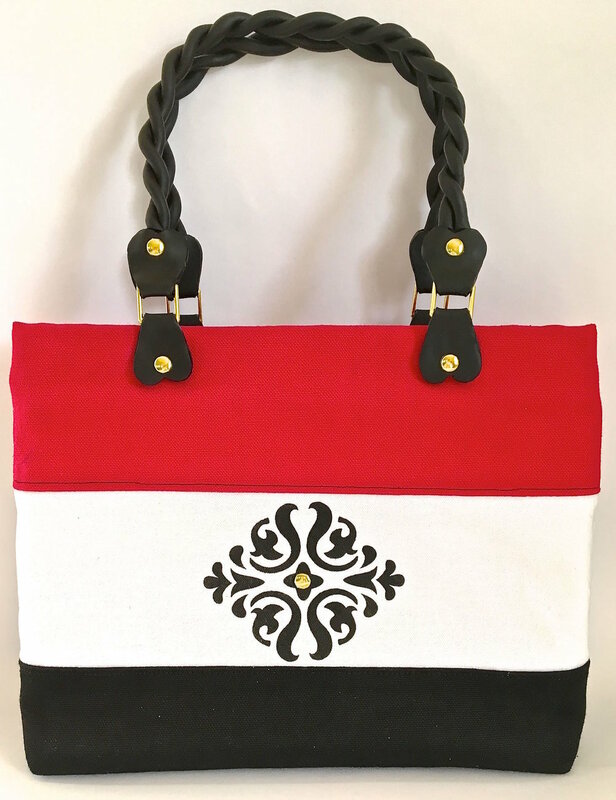 The clean lines of the red, white and black canvas fabric make a bold statement that you can take anywhere. With a simply constructed outer shell this bag includes a lining of canvas which provides lots of body. I added two hanging pockets inside which are optional. The painted image and polymer clay handles accent this project with just the right contrast. All seams are .50” except where otherwise noted. Iron medium weight interfacing to the wrong side of the white panels. Mark the center of the stencil. Spray it with adhesive and center it on the right side of the white panel. step 2 - Protect areas not being painted. Airbrush the stencil with black paint. Repeat on the second white panel. step 3 - Sew red panels to the white panels. step 4 - Press the seam allowance away from the white fabric and top stitch it with black thread. step 5 - Sew white panels to each edge of the black panel. step 6 - Fold the fabric in half matching the top red edges with right sides facing. Pin together. Sew the side seams from the red panel down to the black panel. To create the bag bottom, align the side seam with the center bottom of the bag and press it flat with your hands. Draw a line across the fabric2” from the point. There should be 1” to the left and right of the seam. Stitch across the line. Repeat this on the other side of the bag. step 8 - Press 2" of the bag's top edge to the inside of the bag to create the facing. Sew the two long edges with right sides facing each other. Stitch only 2.50” from the outer edge. Machine baste between the stitching. step 10 - Press the seam open. Remove the basting stitch. step 11 - Sew the side seams and create the bottom corners as you did for the outer bag in step 7. With the fabric right sides facing each other, fold the pocket piece in half to measure 10" x 10". Stitch the sides with .25" seams. Turn the fabric right side out and press the seams. step 13 - Turn the folded bottom edge up and align it .75" from the top edge of the pocket. step 15 - Center the pocket inside the lining and sew the pocket to the lining with a 1/8" seam. Pin the right side of the top lining edge to the right top outer edge of the bag. Sew together. step 16 - Pull the outer bag through the opening in the lining. step 17 - Push the lining into the bag. Condition approximately 4 oz. of black clay. Extrude it with a .25" hole disc or roll it with your hands into four tubes, each 13" long. Make two handles by twisting two tubes around each other. step 19 - Print out two bag handle shapes on card stock and lay the twisted clay on the paper matching the curved line. step 20 - Press a craft stick to both edges of the clay to reduce the thickness and flatten it. step 21 - Print out the tab template on card stock. Using a craft knife, cut eight clay tabs following the template shape. step 22 - Insert a tab into a metal square. Overlap the flattened clay handle end onto one end of the tab. Fold down the opposite end of the tab and match all edges. Press together. step 23 - With scissors, cut all but .25" of the prongs off of a brad. Apply liquid polymer to the remaining stubs. step 24 - Press the brad stubs into the tab. Repeat on all four strap tabs. step 25 - Insert a second tab into the four metal squares and fold the tabs down to meet the matching clay. Press together. Make a hole through both clay layers with an object smaller than the brad stems. Position the hole to match the brad in the adjoining tab. step 26 - Place plastic wrap over black clay rolled on #2 setting of a clay conditioning machine or flatten clay to 1/8” thick. Use a .75” round cutter to create four discs. step 27 - Cure the handles and the discs on card stock supported by a baking sheet, in a 275 degree oven for 30 minutes. step 28 - Place pins 3.50" from the side seams and .75" from the top edge of the bag. step 29 - With a craft knife, create four holes in all layers of the bag's top edge to attach the tabs. Use the pins as guides for placement. Insert brads into the holes in the clay tabs, then through the holes in the fabric. Secure the brad prongs on the facing. step 30 - Apply E6000 to the discs and glue them over the brad stems on the inside facings. Allow the glue to set overnight. step 31 - Attach a brad to the center of the painted design on both sides of the bag. Secure the brad on the inside by reaching through the opening in the lining. Do not attach the brad stem to the lining, only to the outer bag. step 32 - Push the mat board into the bag bottom, fitting it into the corners for shape and stability. step 33 - Hand stitch the open center of the lining.